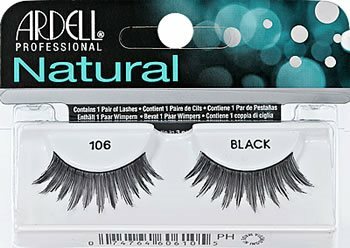 Ardell Fashion lashes #106 are handmade to exact specifications. These fabulous natural looking lashes have longer, beautifully curved strands, which create voluminously full lashes. Works well with DUO Lash Adhesives (for strip lashes), Modlash Adhesives (for strip lashes), Ardell Lash Adhesives (for strip lashes) and Gypsy Strip Adhesive. 2. Align your #106 Ardell false lashes gently to cover over your natural lashes and gently press them together. Make sure not to put mascara on your natural lash beforehand.